If you like Ann's work and wish to own one (or more), call or email Ann to discuss your preferences. Pick-up can be arranged in the D.C. area or delivery can be arranged to anywhere in the world. Ann Barbieri was born in Washington D.C. and attended Trinity College there. Later she studied art at UCLA and then returned to D.C. to continue her art studies at The Corcoran College of Art and Design. Her work has been called exuberant. She often starts with a scene from nature or an interior, working on paper or canvas and incorporating collage to achieve varied textures. 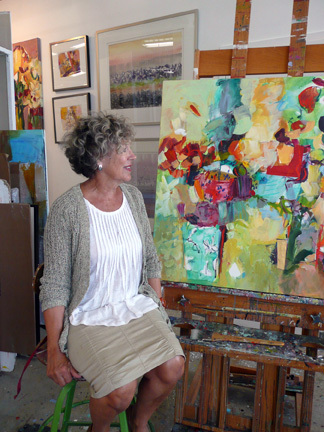 Her paintings are informed by a lively sense of color. She draws regularly from the model and has completed many portrait commissions in her free, colorful style. "I paint the world around me; a yellow lemon on a blue plate, a patterned tablecloth...color excites me, and makes me eager to paint. I strive for rhythm and movement in my paintings. They are loose and sensuous and often have the suggestion of a figure somewhere within. I draw often from the model and that attempt to capture the gesture creeps into my work even if its not meant to be figurative." 2004 "Artist of the Year" by the Friends of the Torpedo Factory. 2005 Target Gallery in Alexandria, VA.
2000 This Century Art Gallery in Williamsburg, VA.
1993 Originals Gallery, Delmar, CA. The United States State Department has selected Ann's work for its Art in Embassies program. For five decades, Art in Embassies (AIE) has played a leading role in U.S. public diplomacy through a focused mission of vital cross-cultural dialogue and understanding through the visual arts and dynamic artist exchange. The Museum of Modern Art first envisioned this global visual arts program in 1953, and President John F. Kennedy formalized it at the U.S. Department of State in 1963. This Century Art Gallery in Williamsburg, VA. The Target Gallery in Alexandria, VA.